The FAL Files - TZ 80 Kabooms: Why? Answers! TZ 80 Kabooms: Why? Answers! We've probably all seen or heard of a TZ80 kaboom. This is Israeli surplus ammo and it had a reputation for ocming apart. There was no warning. There were batches brought in that looked cruddy that rumour had it were tumbled in a cement mixer and resold. Other batches came in and looked fine. Recently Rguns brought another big batch of crap in full of TZ & TZZ of various 80's dates. The KBs have been 80 & 81 dates but some suspect all TZ & TZZ ammo. Well, I had the fun of cleaning the club range the other day after some guys had been out blasting TZ80 ammo. By and large everything went off- no KB's, however there were in my opinion a high number of squibs. Punched primer, no ignition. These got dumped on the ground. I picked everything up. I decided to pull down all of it rather than risk anything- to salvage the M80 projectiles. What I found when I pulled them down surprised me. I used an RCBS impact bullet puller and dumped into a plastic Akrobin. First, there was very little sealer on the bullet to the case neck. Nearly none. Second, when I dumped the powder, almost nothing came out. It was clumped into the case. Third, as soon as I pulled the bullet I got a strong STRONG odor of ammonia from the case. I scraped the inside of the case with a small screwdriver to break up the clumped powder (ball powder) and pour it out. There were lots of greenish and whitish clumps in the powder and the bullet base was pretty corroded and clumpy. The inside of the case was heavily corroded- green, pitted, and looked pretty masty. The powder would hardly light- I extinguished a wooden mach in a pile of the powder. And did I mention the stink? Ammonia! In most cases it appeared the primer had ignited but the charge did not ignite. What was surprising was all of these duds looked OK on the outside- a bit tranished maybe but otherwise OK. It's what was inside that mattered and they were terrible. I wound up trying to ignite one of the cases full of clumped powder and it only ignited once I stuck another match inside and lit both matches at once. Then it fizzled, spat, and burnt greenish-yellow and smoky. The inside of the case was now black and sooty and you couldn't easily tell it was a bad case. 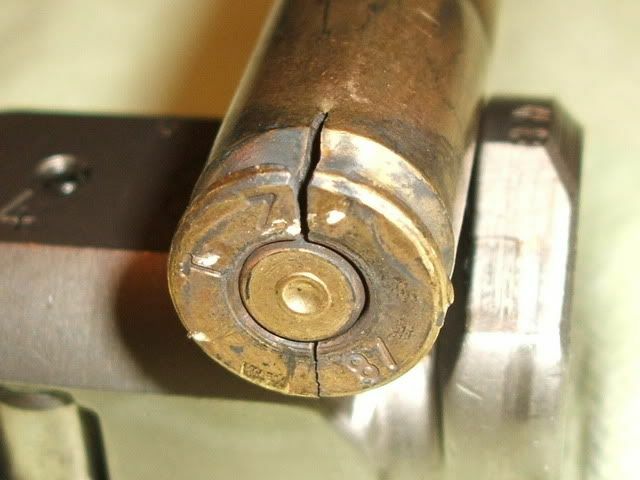 So, the TZ/TZZ 80 brass problem may not have been due to brittle brass like we thought- IMHO it was due to chemical corrosion resulting from the powder breaking down inside the case. I think it was because of a poor seal where the bullet joined the case. This allowed air or moisture inside to degrade the powder. Once the ammonia was released it started eating the brass (as ammonia will do) and that was what weakend the cases from the inside and causes case failure. Your theory makes me wonder about the shelf life of my reloads that have no sealant around the bullet. Hell, most of my bullets are pulls and not even round or true. Never really worried about it because all the bullets are run through a 21'' "resizer". I would have to say that contamination at the time of manufacture played a role as well. Stored in a home, or even an unheated/uncooled garage, your reloads are probably safe. It sounds as if the TZ/TZZ problem rounds may have been stored in really poor conditions, possibly with extremes (temp, humidity, etc.) of one or another. It might even have been a batch of powder that was manufactured incorrectly. Thanks for doing the leg-work on this matter. All of the Israeli surplus sold in this country came from a single source; Israeli soldiers. When an Israeli reserve soldier goes on duty, he is issues a standard load of ammo. He carries this ammo throughout his tour of duty. If it is not used, he turns it back in when he is finished. This ammo may have been loaded in magazines or belts, been exposed to sunlight, rain, and extreme temperature changes, or whatever else the soldier experienced. This ammo that was turned back in is not re-issued, but used for training or sold as surplus. If the sealant was defective, it explains a lot. I've got a good bit of it socked back, and was planning to pull it down for components. I'll keep an eye out for what you've described. Good post evan. Wonder why 411man didn't know about this? How is it that a powerhouse country tah makes fighter jets could make ammo that consistantly splits cases You would hae thought they could have figured out the problem since it existed in the late 60s through TZ82 ammo. ,,,,,I've got a good bit of it socked back, and was planning to pull it down for components. ,,,Not all that up on reloading, my brother-in-law and neighbor are the ones helping me. I have a boat load of this ammo,,,TZ 77. I take it that using the original bullet and case SHOULD be fine with the introduction of new power and primer?? The problem is that alot of people think the cases are bad. I don't know. I personally think the problem is partly due to the powder charge. A buddy of mine before he knew me bought a .50 cal can of Izzy ammo that was being sold as "match" ammo. Poor guy. Anyway, I had heard it was bad, and after I had one round burn a hole through the case I decided to look into it. I pulled about 20 rounds. Charges varied by as much as 5 GRAINS. I loaded them to a consistent load on the low end and didn't have any problems with the reloaded rounds. It is totally possible I just lucked out on the 20 rounds, I don't know. The remaining rounds are getting donated to a friend who is just getting into reloading as a direct result of his recent purchase of an M1A. > cases from the inside and causes case failure. So that would explain a 'squib' but not a KB. You would have to be really unlucky to ignite a case that had degraded enough powder to make the brass brittle, but still had enough viable powder to generate enough pressure to force a case head rupture. Given the relative speed of things, the powder would all degrade before the brass became so brittle. > I pulled about 20 rounds. Charges varied by as much as 5 GRAINS. 5 grains overloading will not cause a burn through the case. I had several total case head failures in this ammo from Virgin sealed wooden crates that held two sealed ammo cans. This was not misstreated ammo with spots, stains etc. Failed Cases were undamaged from corrosion inside, but yet they still failed with a split through the primer pocket and up the extractor cut about 1/2" right up the side of the case. Sure much of the "salvage ammo" is crap for shooting...... but this stuff fails because the Cartridge Brass is BAD. I was just pointing out that TZZ headstamped ammo is in the supply chain, and you might see some in a training environment. You just went off the deep end on your own. Is the more recent stuff better? I have had consistancy problems with all imi,tz,tzz I have shot.......some of which I could actually here the difference in the report. I'm on my crackberry so my google-fu is a bit limited. Right now I think Alliant is running the Lake City plant. What that means is anyone that Alliant owns or is partnered with can also supply ammo for the military contract. The ammo that is supplied by the alternate sources is used for training. IMI\TZZ has an alliance with Winchester, which I think is owned by Alliant. At any rate, I've seen TZZ .45 ACP recently so anything is possible. I blew a primer and case head with tzz 94 with a 1 and 4 on the east and west side of the case head. Hhis ammo came in 30 round brown boxes about 15 years ago. Blew the primer clean out of the case and into the works of the AR. The head had a crack in it from the primer pocket almost to the rim. This was in my bushmaster DCM gun during the slow fire stage at my club match. I did clear the rifle with a leather man tool and finish the match in the last two minutes. I would not have liked to Kaboom that DCM top end. Anyone else have any problems with TZZ 5.56? Both 5.56 and 7.62 was issued to the ADF here in the 80s I still have a couple of 30 round boxes of 5.56 (M193). In the late 80s all the 7.62 tracer linked up with the F4 here was Israeli. Nay an issue. Generalisations are dangerous. There was some shyte Aussie F4 around in the 90s here. Failed QC for various reasons none safety related. It was sold bulk packed to rifle clubs (1K or 1.2K loose packed). It went bang. Maybe some of the Israeli ammo in the US failed QC from the start and someone bought it as scrap but decided NOT to pull it down ? Purely theory. Re: TZ 80 Kabooms: Why? Answers! I have a couple k of various Israeli surplus from Southern Ohio Gun that I "sifted" by shaking each round next to my ear listenting for the sound of the powder rattling. About 10 percent of the batch made no sound. Those I began to pull the bullets and most were water logged. I haven't shot but a few rounds of this ammo just because of the concerns voiced even though I took out all the 80 stuff. Just another data point for reference. I have never heard anything bad about Israeli 5.56, everything else is a different story. A friend of mine's curiosity was piqued when he noticed how far an Israeli manufactured .45 bullet was driven back in to the case on the first loading. Taking the base of his palm, he was able to easily (and quite comfortably) drive every bullet back in to the case from several boxes. Although I can't recall the nature of the failures, I once saw someone shooting Israeli 9mm ball that was unable to make it through a magazine without numerous malfunctions, but when switching to a different brand everything ran fine. So that would explain a 'squib' but not a KB. A squib won't result in a KB, but the next full powered round fired after it likely will. Right, but no one is reporting squibs. Just KBs from ruptured brass. I think it was the OPs theory that the powder degraded, causing the brass to become brittle. I think the problem is that it was just bad, brittle cartridge brass in the first place. If the powder was degraded, but the primer still happened to be good then it would launch a bullet in to the bore which would largely make the brass metallurgy irrelevant. Yep that is how the Bad stuff fails.... Bad, BAD brass. Not from corrosion or old powder or storage issues either. Failed Cases like this are the ones to examine for reasons of failure. Not misfires or stained cases that are found on the ground. when other -much lesser- countries were able to make quality ammo? I have had various Fobus products & Orlite mags in my possession that beg similar questions. There is a great deal of IMI ammo with fine quality brass! The "bad" stuff seems to fall in the 1980 range give or take a year or two. Perhaps they changed equipment or suppliers in that era. Maybe this was run on SCAMP equipment...not their regular production facility. Hard to say, but all "quality mfg" have had issues over the years. A problem or recall from an isolated issue does not mean all from that maker is crap. If that was so, you would be condeming: Federal, Winchester, Remington, Lake City and so on. I will shoot plenty of IMI ammo without a flinch..... But NEVER a 1980s IMI 7.62NATO round! Or a 1975 CBC one either! Now you people got me thinking. Had to look at my shooting logs, I did have an issue with some Tzz 1980 5.56mm, Happened about two years ago, Noted in the log, Ammo had various high low cycle rates in full-auto Colt Commando SMG and then a KB accured, Got home that day and pulled about 30 rnds down and measured the powder charges, Some was right on the money and some was short charged. When I received it from Paragon sales years earlier it looked like battlefield pickups with black colored film on outside of brass. Decided to pull all 4000 rnds down and reload, Had to add about 3/4's of a pound of powder to complete reloading all 4000 rnds. After that no problems at all. 1. Countries changed weapons that require new caliber. 2. Ammo produced is bad lots. 3. Ammo has reached what country feels shelf life has expired. Manufactured to NATO specifications by DAG (German), 7.62x51mm (308 Winchester) . Produced in the 1990's and loose packed in a 50 Cal ammo can. The 147 grain Full Metal Jacketed Boat Tail Bullet has a complete plated steel jacket, lead core. The Brass case features a Non-Corrosive berdan primer. There is some light corrosion on some of the brass cases. This corrosion will not effect firing, but it very visible. Please see the attached photographs. PLEASE NOTE THAT ONLY ABOUT 30% - 40% OF THE ROUNDS HAVE ANY CORROSION ON THEM AT ALL. THE REST OF THEM ARE OK. THE PHOTO SHOWN IS THE A COLLECTION OF CORRODED CASES JUST TO SHOW YOU WHAT 1/3 OF THEM LOOK LIKE. Not Returns on this item it is Sold As Is !! Normally they do a range report, Guess they got a little scared with this stuff to take it to the range for testing like they normally do before the sell a type of ammo. Or their so busy due to increased sales that they haven't had time to get to the range and test it and give feed back on performance.